Mark: This week’s question is from Oscar Berko one of our platinum students but it is a question that we’ve been asked a few times and rather than just sort of replying individually now to people especially within the public Facebook group what I thought was I will sort of cover it in this week’s Q&A and really the question is how do you value, appraise a property that is difficult to find recent comparables for in the local area. Now, this often happens with apartments or flats and also it can happen with properties and the larger properties that are maybe are put in higher values so basically a property that don’t sell quite as often. So if you imagine in an area where there are hundreds of properties that are several hundred thousand pounds, transactions for those types of properties in those areas are fairly frequent so the chances of finding recent comparables within the street or within a couple of streets is quite high. Now, where you might struggle, for example, is in an area where maybe a large property has been converted into flats and you want to know what the value for flats is going to be but there are no flats in the local vicinity. Now, one thing I have to be very clear on with this is, like I mentioned earlier on, it’s not science so it’s not exact. Appraising property is always going to be a ballpark figure. We are not surveyors. We are not RICS qualified. We are simply getting ideas to what a surveyor might go around and value that property at based on the comparables which is what surveyors use to come across them. So remember there are lots of things to factor in and one of the other things, a really important thing is remember the areas can change within a quarter of a mile so what I’m about to go in terms of the answer just make sure that before you go into the comparables, you do a little bit of extra due diligence so another level of due diligence which is checking out the area. So you can use websites such as streetcheck.co.uk and make sure that the areas are similar. So if you find apartments within a few miles, do a demographic check on streetcheck. Just make sure that it’s the same type of person, same employment ratio, et cetera and that will give you a good idea in terms of selling value. So two points to really remember. It’s not an exact science so don’t really get too overconcerned about. You want to get as close as possible but don’t let it put you off just putting the numbers out there, If at ever any doubt err on the side of caution not on the side of hopeful so just remember that. So first of all, I’m going to tackle flats. So for my example I mentioned before flats, if you’re in a conversion for example, what you can do is spread further out than your normal radius so normally the way that we teach is you’re looking for comparables within the last 12 months and within the last 12 months you want to be searching within a quarter of a mile radius if there aren’t any within that post code. Now, with flats but there aren’t any flats in the area, you’re going to have to work at a sort of comparable rather than working out a flat value. You’re going to try and work out a price per square foot value based on the apartment. So if you’ve got the square footage of the flat that we’re trying to value and you’ve also got floor plans for the apartments that are within the vicinity, you can work out a price per square foot and use that to approximately value the apartment that you’re looking at and alternatively you can also look for flats that are again, a little bit further out but in a similar area and use those as comparables as well. So those are two sort of ways to do it. Flats in general unless the area massively changes in terms of the affluence of an area, flats will generally be similar amount. You’re never going to have much of a deviation in terms of price points for apartments. So flats you would do that way. With larger houses, it can be a little bit more difficult because as an estate agent when you’re valuing property and you go to larger properties, you are actually basing the value of the larger properties on your own experience of dealing with similar properties outside the area so you can use your experience in order to be able to value a property. Now, as sources if you haven’t got the advantage of 10 years estate agency experience then you’re going to have to do it slightly differently. Now, one of the obvious ways of course is to speak to a local agent with plenty of experience to get their opinion on the value of the property. Now, some agents aren’t as helpful as I’m just giving you the information but one thing to do is if you explain to them what you do, what you’re looking to do and what you can obviously work with the agent on, ie. resale, a larger house gets a bigger fee. A bigger fee means that the agent’s more likely to help and that means they might give you a ballpark figure to work from. So speak with local estate agents. But then the other thing is just exactly the same as apartments, just do a wider search. So check the area, do a wider search and try and find properties within a wider search area that are similar again paying special attention to the area that the tenant type, the demographic doesn’t change too drastically and in the wider search radius. Or the other thing is just get a feel for what may be is, for example if you’re looking at a 5-bed house, if there are any three- to four-bed houses, what they’re worth and then so make a sensible judgment in terms of how much you can add value on per room. So that’s another good way of – sort of getting an approximate market value and hopefully that helps across those two but just like I said before, it’s not an exact science. It’s just to give you a ballpark figure that you’re going to work from. Err on the side of caution and you shouldn’t go too far on. Mark: Hi, everyone and welcome to this session of Sourcing with Mark. Now, we have got, by the time this goes out on air, we will have approximately two in a bit weeks until Christmas so notoriously at this time of year everything starts to shut down. So we’ve got estate agents that start to tell their sellers that clients are off over the Christmas period. We’ve got people now spending more time going out Christmas shopping, Christmas parties at work, you’re starting to do – if you’re in a job you’re going to be starting to do all the Christmas party games during the day. You’re not going to be working as hard. You might even go onto skeleton staff over the Christmas and New Year break so it really does quite enough. Now, I can be as guilty of this as everyone. At this time of the year I like to spend a bit more time with my family. My dad comes over from Portugal which is great so needless to say I don’t want to spend as much time grafting in the office and more time with being at home with my dad and my wife and children. And also, the other thing is that you might find that people on the flipside aren’t necessarily reading your letters as much or picking up your leaflets anymore because again, they’re distracted, they’re thinking about what they’re cooking for Christmas meals, what they’re going to buy for presents, they’re going around and visiting family. So what this means is that certain marketing techniques do not hold as much, pack as much of a punch this time of year and what we don’t want to do is spend a load of money on marketing that’s going to be chucked in the bin, ignored, you know, saying put it to one side until the New Year. The chances are it won’t be – they probably won’t even read it. Now, what this doesn’t mean is that we switch off as property sources but what we need to do is we need to focus on marketing techniques that are a lot more laser targeted and also marketing techniques that aren’t necessarily going to involve taking up too much of your time so you’re going to have highly targeted campaigns but you’re going to have them so that they’re semi-auto so that you can go out and still do your Christmas shopping and spend time with the family. So some of the ways that we’re going to do this, I mentioned at the beginning, a lot of agents will tell their clients when they’re selling property that Christmas can be quite a quiet time of year. People aren’t viewing as often so what they do is they advice their clients to take their properties off the market for a month or so, a month and a half and then put it back onto the market come end of January, beginning of February when there are a lot more buyers around. Now, what this means for us as property sources is great. It’s great news because a lot of the non-motivated sellers, i.e., the people that want silly money for their house and are convinced that by bringing it off the market and putting it back on the market they’re going to get a buyer that comes on to pay for market value in February. They take their properties off the market. So what this means is that the properties that remain on the market may well be a lot more motivated than they might have been a month ago. So one of the big things we’re going to do is we’re going to compile a list of properties that tick certain boxes so I’ll come on to those in a minute but what we’re also going to do is we’re going to work with the agents. 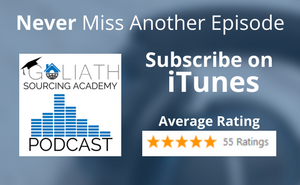 Of course, if you have been following the podcast and doing as I have suggested, you will already have built a solid relationship with a couple of agents in your local area. Now, this is the time of year that you want to be going and visiting those agents with a box of chocolates, with something Christmassy and just as a bit of a thank you or a thank you for what you’re going to do for me in the year ahead, a bit of psychology there but it also allows you to go in and ask the question, is there anything they can tell you about anyone that’s keen to sell before Christmas or before the New Year? Or as close to the New Year as possible? Now, they’re going to know that you’re serious. They’re going to know that you are either buying yourself or you represent investors and you may well find that they are open to discussing deals that they might not have been open to discussing before. So always ask the question. Now, for those of you that haven’t built up that relationship that’s going to be a little bit harder but again, just pop in to a couple that you like dealing with or that you’ve spoken to, who you like the staff in the office, just pop in with a bunch of – or a box of chocolate so you can buy them now for next to nothing. I think they are designed for giving to people these big tubs of chocolates like agents, solicitors, surveyors, et cetera and go in and just speak to them. You know, have a – they’re going to be quiet as well so use this as an opportunity to go in and have a chat with them. Now, the other thing is go and view some of these properties that have been on the market for a while. You know, view few properties with the agents. Use this at time as a good opportunity to build a relationship with these agents but also make plenty of offers. So offer on lots and lots of these properties because even if they don’t accept them before the New Year, you put your offer in so they may well become a little bit more motivated in January when the Christmas rush has gone off. They might well then consider your offer. So just try and make as many offers as possible and you can do this either with agents and/or you can write to these properties directly making offers based on what you’ve seen online, in terms of the photographs. You just put an offer straight up to the vendors, say it subject to viewing of course but it just gives them a number to consider, you know, bearing in mind they’ve probably never had an offer suddenly you’ve got an offer for it. It might be low but the chances are that they’re going to potentially consider that if they are motivated. Now, I mentioned a little bit ago about lists. So I’m just going to tell you a few lists that I would recommend building and now in order to get letters out to these people now before Christmas. So one of the big ones is anyone that has reduced their price, so price drops within the last week to three weeks, they are potentially very motivated sellers. The reason being they’ve reduced the price in order to try and expedite a sale before the New Year. So anyone that has dropped prices you want to be building up a list of price drops. Now, another list that you want to be building are again, properties that have been on the market for over three months so 90 days possibly even 60 days just to again, get that letter out and just try and spur on some interest from them. Again, if you can get direct to seller even better. Now, another curve ball of a list which is – it will take a little bit more time to build but it’s a very good list to demonstrate the motivation of sellers. Any sellers, any description changes that have been noted on Rightmove are potentially signs of people wanting to sell their property before Christmas. Agents will often change their property descriptions based on the motivation of sellers, i.e., how keen they are to sell and how much they’re on the phone. So you can just scroll through and one of the content upgrades this week is a video demonstrating property descriptions. I’ll show you exactly what you’re looking for and how to build a list of those. And the other content upgrade is just a video on how to download Property Bee. So for those of you who are thinking how in the world do I go and get these lists? How do I get this information of Rightmove? I haven’t got access to that and it’s a free plugin on the Mozilla Firefox browser and one of the content upgrade this week is a video demonstrating how to install that. So just a recap, those are the lists, surprise drops on the market for over three months and property description changes within the last week or so, so anyone within the last week that has changed the property description I would be very confident as motivated to a point. So write them a letter. Just say you’re interested in speaking with them about the property and see if you can strike up a viewing before the Christmas period and see if you can get an offer in. So just to recap, just to summarize. It’s a funny time of year. A lot of people do switch off. They do start to quiet down, ease off and do less work, go and enjoy themselves which is fine but serious property sources are going to make sure that we’re still doing some sorts of activity each day, each week that is going to spur a response. So whether it’s a response now or whether it’s a response in early January, the point is if you don’t do it now you’re going to be starting your marketing campaigns from January again completely cold. So just remember, look for the changes and on Rightmove. Make sure that you’re contacting these motivated sellers and when you do contact these motivated sellers just make sure that you’re letting them know the benefits of working with you directly so we’ve got no chain, you can exchange quickly, you’re a very serious buyer, all those sorts of things and if you do all of these over the next couple of weeks, you stand to either get some really good interest this next couple of weeks. Or, more importantly, you’re already building the foundations for 2017 to go into the year running. So hopefully you’ve enjoyed that and as always, happy sourcing. Brad: Hi and welcome to In the Lab with Brad. 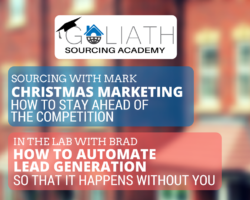 This episode, how to automate lead generation so that it happens without you. Now, as you can imagine I speak with a lot of property professionals that are sourcing to either package deals or to keep deals. Now, I see a common thread running through almost all of them. They struggle with the fact that the lead generation activity is really a series of inconsistently timed sporadic events. What do I mean by that? Well, the stories that I’m hearing are that the task to create the leads are getting done, the leads come in for a while but then the next stage of activity becomes all consuming for example doing due diligence, viewing the property, keeping in contact with sellers or landlords and so on. Now, while all this is going on, the lead generation activity is taking a back seat, i.e., incoming leads either drop significantly or they dry up entirely. Now, if the deal that is taking up so much time doesn’t come through then you’re left with no deal and no lead flow. Now, I see a similar pattern happen with trades people, plumbers, et cetera. They look for leads. They get a lead then they get a job off the back of some of those leads. They do the job then three days before the end of the job they’re running around panicking about not having a job lined up as they don’t have any leads coming through because they were forced to drop that lead generation activity while they were doing the job. Now, what should be happening is the lead should be coming in while they’re on the job and this is the same for property professionals. The goal should be to have a regular flow of leads coming into your business regardless of whether you have the time or not to generate them. But how do you do this? Well, you can overcome this by automating your lead generation, so that it happens without you. You’re creating essentially an efficient lead generation machine that’s always humming away in the background day after day, week after week. Now, the other big benefit to automating lead generation is it freezes up your mental energy to focus on higher income-generating tasks. Now, if you’re waking up on a Wednesday morning and all you’re thinking about is getting on to Gumtree and messaging sellers in the same way that you’ve done 10 times before, then you really need to keep listening and you really need to understand the process of automating that task. Now, think about doing – thinking about doing tasks is in my view more mentally draining than actually doing them. So in order to grow your business you must divert that mental energy into bigger, strategic thinking and not waste it on these lower-level tasks. So how do you do it? Well, it’s three steps but before we get into those three steps, let’s just talk a little bit about the systems and the automation mindset and mental habits that you must really start to think about adopting. There’s a great book by Sam Carpenter called Work The System. And he says everything works fine 99.9% of the time. Now, if you look around you whether it be in your office or your dining room where you are, your kitchen where you are maybe, at the train station, in the car, everything around us basically works 99.9% of the time. So putting what you’re trying to do into an organized system works with the way the world works. The people don’t do the work now that saves them the time later. Why? Because ironically they think they’re too busy. Now, this is an investment of your time for a late return. A kind of like a return on time invested. Okay, so let’s get into these three steps. These three steps are do, document and delegate. Very simple. So firstly, you need to pick the tasks. So you’re going to now look to try and create a system and automate. So let’s take the — let’s take portal scraping from Rightmove as an example. So first step is do. So you actually need to do the task a few times yourself. So understand what needs to be done in detail. As you do it, think about the workflow and the steps that you’re taking. Stop to consider the minutiae of the method that you’re using at each step. It’s likely that you’ve done the task a few times so you’re doing it on an autopilot. So it’s all the more important just to consider each of the steps that you take along the path to get the task complete. So step two is to document the process. So documenting can be writing at a standard operating procedure document. Something similar to that using a piece of software to be able to do it like process.st something like that but for a task that is so visually based, scraping leads from Rightmove, I would create a training video. But before you create any videos, you need to have broken down the task into chunks. Now, scraping a lead from Rightmove may seem simple enough to you but when you’ve never even looked at Rightmove before which actually applies to a majority of kind of freelance VA’s that you’re going to be using to get to do this task, you’re going to need to spoon feed them. So let’s look at how we could break the tasks down into chunks. Chunk one, input the search criteria. Chunk two, scan the property data using the property B plug in and identify the listings you want the data for. Chunk three is to find the full address of the property and chunk four is input the data to the CRM system or spreadsheet. Okay, so there are your four chunks. Now that you’ve broken down those tasks into chunks, it makes it much easier to begin to document the system in a series of shorter training videos. Now, it’s so important when you create your training videos to be as detailed as you can. If the task takes you 10 minutes to do, it’s likely your training video will be at least 25 minutes long. If you don’t create detailed videos then you cannot expect to get quality work come back to you when you delegate the task. You’re essentially asking for that freelance virtual assistant to essentially read your mind if you don’t tell them exactly what it is that you want them to do. 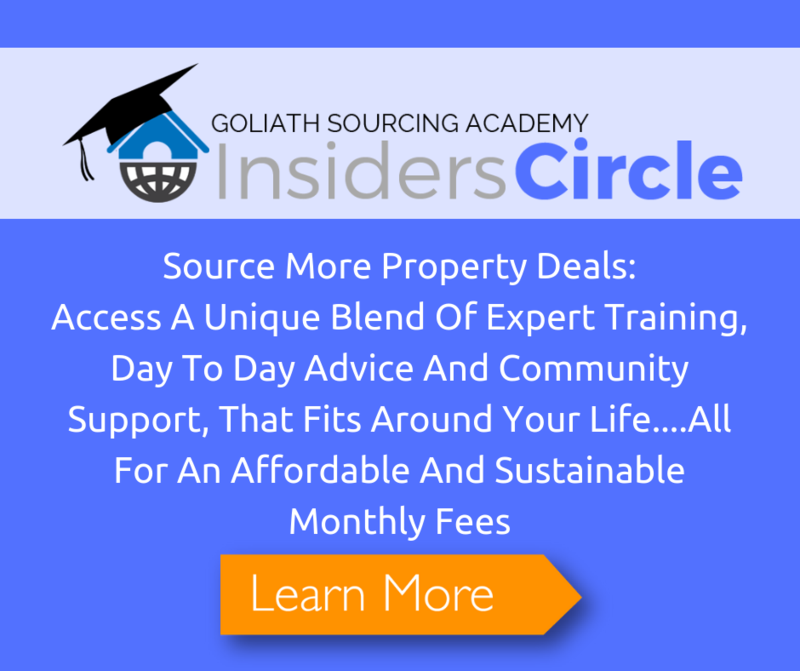 Now, to accompany this segment, you can download one of the training videos that we use in Goliath Property Solutions. It’s just under 35 minutes and it shows you really the level of detail that we go into when putting a training video together for our virtual assistant. You can find that at goliathsourcingacademy.com/session15. That’s goliathsourcingacademy.com/session15. Okay, next, step – in this three-step process is delegate. So just go back we’ve done do, actually doing the task yourself, document is the second step, third step is delegate. So now you need someone to actually do the task for you. Now, for a task like our Rightmove example here, getting an overseas freelancer through Upwork for example will be fine. 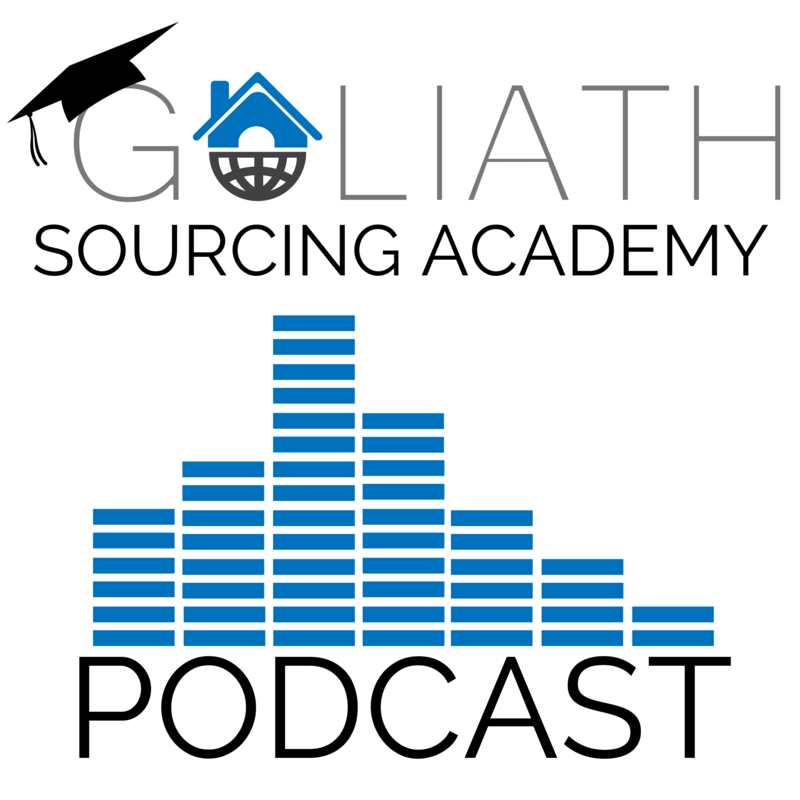 Now, if you refer back to episode three of the podcast which is on the 10-minute starter guide to outsourcing you can find that at goliathsourcingacademy.com/session3. That will take you through step by step on how you can basically find a VA through a site like Upwork and get them to do these tasks for you. So there’s the three steps, Do, Document and Delegate. Pretty simple but they actually need to get done. So right, I’ve touched on this earlier but in reality just to really a small percentage of people will actually create the systems required to automate lead generation. Why? Because most of us can’t really see into the future so doing something now that will impact us positively later is quite highly disciplined work and you’ll see that from the training video example that I’m giving you. A 35-minute training video doesn’t take 45 minutes to produce. It took time. Now, most people want instant results but being property investors we kind of know the concept of ROI, return on investment. So go a step beyond that and think return on time and systems investment. The systems and the automation mindset requires that you put in upfront seemingly unimportant effort but by doing so will save you effort and mental energy time and time again moving forward. Now, most importantly you’ll have consistent leads flowing into your business rather than sporadically coming in fits and starts. 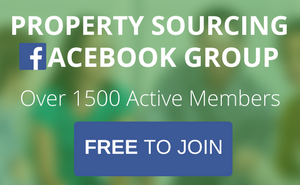 Where should we send your "Installing Property Bee Plugin & How To Identify Motivated Sellers Via Property Description Changes On Rightmove" link and password? Where should we send your "Systems and Automation Checklist and Training Video Example Download" link and password?